From the acclaimed author of Fragrance of Grass, comes a meditation on water and nature, fishing and growing older. On the Water, is a gorgeously written collection of essays that all take place on or near the water and pay tribute to the flora and fauna associated with those ecosystems. There are essays about the finer points of tickling rainbow trout in the streams of Normandy, and of eagles and ospreys fishing for bass while barely breaking the surface of the water. There are stories of droughts and floods, of dogs and boats, of worms and rattlesnakes and even of catching and cooking soft-shell turtles that taste like osso-bucco. There is fishing and diving in the Bahamas, tarpon fishing in the Florida Keys, and fly fishing for sailfish in Central America. And there are larger-than-life personalities that are bigger than the fish tales they tell! On the Water is a finely honed and well crafted collection of tales for the true sportsman and makes for a perfect companion volume to la Valdene's celebrated collection of essays on hunting. "Guy de la Valdene's On The Water is more than a fishing memoir. He remembers his wild youth in the Caribbean, handling sharks at night and chasing waterspouts, and his intense days flyfishing in salt water with literary legends. He contrasts them both with wise and sometimes melancholy thoughts at the pond he made on his farm, seeing nature in this microcosm like a earthier version of an old Zen sage. Shake your head at the recklessness of youth, revel and laugh with the writers, and learn from his hard-won wisdom." - Steve Bodio, author of Field & Forest, Eternity of Eagles and many more. 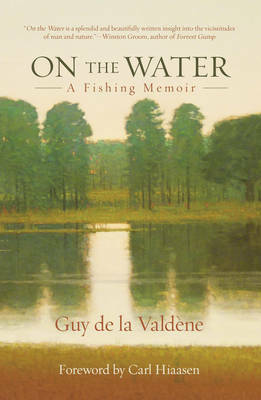 "Guy de la Valdene's On The Water is more than a fishing memoir. He remembers his wild youth in the Caribbean, handining sharks at night and chasing waterspouts, and his intense days flyfishing in salt water with literary legends. He contrasts them both with wise and sometimes melancholy thoughts at the pond he made on his farm, seeing nature in this microcosm like a earthier version of an old Zen sage. Shake your head at the recklessness of youth, revel and laugh with the writers, and learn from his hard-won wisdom." - Steve Bodio, author of Field & Forest, Eternity of Eagles and many more.